Inder Loves Folk Art: Christmas trucks. Mom arrived with a suitcase full of GIANT CROCHETED STOCKINGS for everyone in the household! Just wait: If these don't make you smile, you will want to have someone check your pulse. 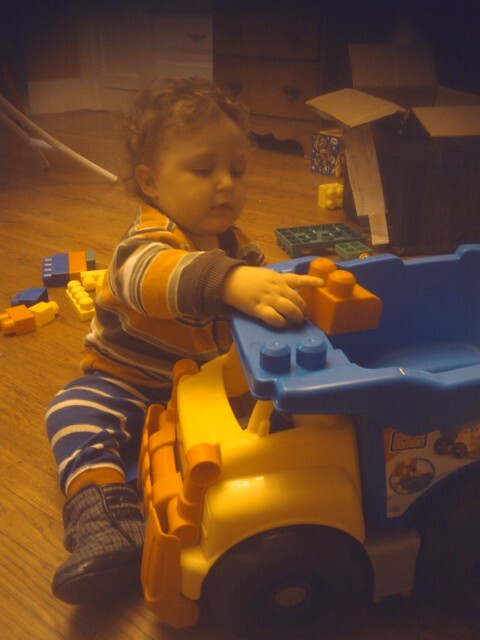 In the meantime, Joe got his first gift yesterday from Auntie Krishna, Uncle Mikey, and Cousin Jaki: A giant dump truck full of "Mega Blocks" chunky building blocks. A more perfect gift for my truck-loving, building-block-loving baby boy does not exist. Here is a low-quality shot taken with my cell phone this morning. Check out those dimpled knuckles!